Last Friday, we had a bible study and the key verse is Matthew 7:7. There is a difference between ask, seek, and knock. Something major is happening in my life right now. And I am seeking His will for me. It’s through reading His Word that we could know His will for us or in the form of other things. And today, I’m taking His answer through a pastor in church channel about Exodus. When life happens to you, what are you gonna do. Sometimes, it makes me want to just be a spectator, an audience to a korean series. Or something like that. Being the lead actor can be hard. Life happening is hard. Because you have to move. Action is required. It may leave you disappointed, hurt, but it can leave you happy, and satisfied. God knows us. We may not understand most of the time, but seeking and finding His face amidst the chaos is the most comforting. All in. I have to give it all in for God. Life is full of humor. Sometimes it’s not funny. Especially when it involves the heart. I don’t know why it has to happen. What should I learn from this? Is this just supposed to hurt me? What’s the purpose of this? What should I do about this? There is this food place in Gil Puyat, just in front of the BBL Bus Terminal, that sells bread and other meals. Last Monday, because I woke up late and took a long time preparing to go to work that I was late for 2 hours, I decided to stop by this place to let the sunshine in from all this thumpings. I didn’t know that I was about to discover something great–the superb Macapuno Pie. Now, this pie is just small, I guess it’s just 2 inches in diameter. 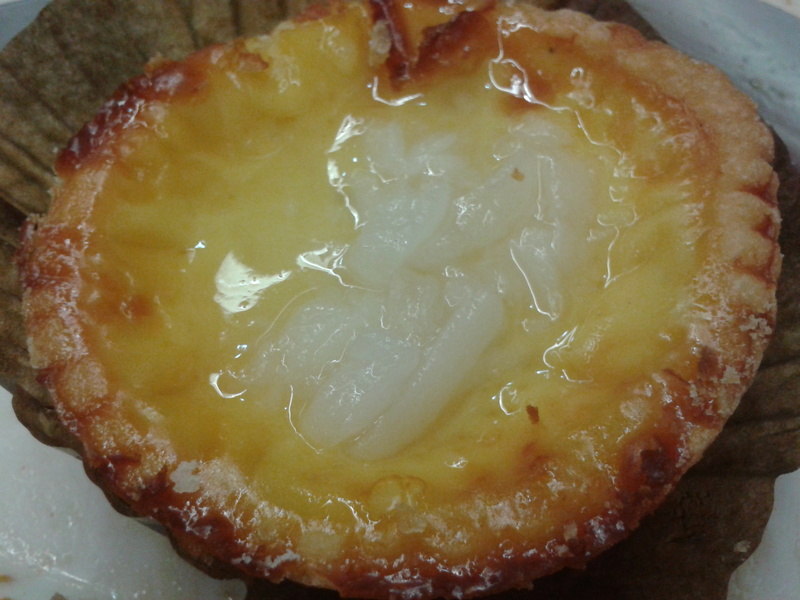 The base is a pie, soft and nice, next is a thick layer of egg custard but I’m not really sure because the consistency is like that of a custard but the taste is a bit bland–not so sweet which is perfect for the top layer of macapuno. It was quite expensive at Php 22 per piece. But it’s worthy of my cravings! I guess it’s just fit to be called a craving because I exerted an effort to go there a while ago for dinner. The bakeshop is called Simply Bread but it was inside Chubby Checker and the bread and pies are made by Chef Andrew according to the label on the plastic bag. They have other bread and tarts, and pies but I haven’t really tried them, the macapuno pie just happened to catch my attention. I recommend its baby back ribs. I may not be an expert on steak and all those meat but I truly enjoyed the rib which unfortunately is not my order but E was nice enough to give me some. I ordered Steak a la Pobre and as appetizer, fish and chips.